Located on the west side of Galway Harbor, the traditional thatched cottages that once existed here are long since gone. While they have been replaced with more modern houses, the area still has its local charm and fame. Visit the area to take a walk along the pier where you will normally find some locals fishing, or to simply relax in the park that sits just off the pier. 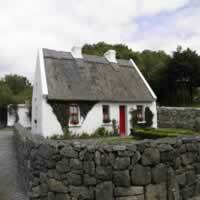 The name of the Claddagh area is based on the Irish word 'cladach', meaning a stony beach. People have been gathering seafood and fishing from here for millennia. Historically, its existence has been recorded since the arrival of Christianity in the 5th century. Throughout the centuries, the Claddagh people kept Galway City supplied with fish, which they sold on the square in front of the Spanish Arch. The area has been immortalized through its traditional jewelry, the Claddagh Ring, which is worn by people all over the world. 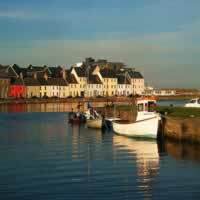 Located just half an hour outside Galway by bus, this small seaside village is in the heart of Connemara and is where you can witness the Ireland portrayed in postcards and movies - picturesque stone walls and green fields. It is also one of the few places where Irish is the first language. To get to Spiddal take bus #424 from the bus depot. 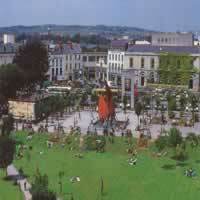 Effectively the center of Galway City, Eyre Square is your starting point if you want to go anywhere in the city. There are pubs all around the square and the train station is right beside it. The park in the center is dedicated to President John F. Kennedy who was made a 'Free Man of the City' shortly before his death. 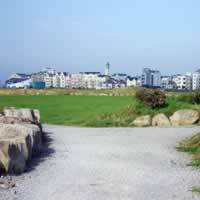 This pleasant neighborhood on Galway Bay has a beautiful promenade and beach, which is particularly nice during the summer months for walks; on a clear day you can see County Clare across the bay. For those interested in marine life the National Aquarium of Ireland is located here. 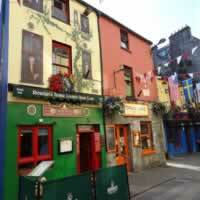 The Latin Quarter area of Galway consists of Quay Street and the streets surrounding that, which contain many bars, restaurants and theatres. It is the perfect place to go if you are looking to eat, drink or just simply spend some time marveling at the street performers that line these streets.